Neem is revered by Ayurvedic practitioners for supporting oral hygiene, the teeth and gums. Used for centuries, Neem toothpaste will leave even the most sensitive mouth feeling clean and refreshed. The Neem Tree is also known as the 'Toothbrush Tree'. An alternative to 'chewing twigs' , this intensive product is a ideal formula for those who prefer natural & fluoride free ingredients. Suitable for use by vegetarians, diabetics and children. Fortified with Concentrated Organic Supercritical Extracts of Neem Leaf, Neem Bark & Sea Buckthorn to support healthy teeth and gums. Sea Buckthorn has been harvested for thousands of years for its rich nutritional profile and medicinal value. It may be the only plant in the world to contain all 4 Omegas, (Omega-3, Omega-6, Omega-7, and Omega-9) which are essential fatty acids that assist in nourishing and soothing gum tissue. This Neem toothpaste was formulated to be extra gentle for kids' teeth and gums, with Supercritical Extracts of Neem Leaf and a great tropical flavor that your kids will love! For adults and children 7 and older, use a 1-inch strip of paste. For children ages 2-7, use a pea-sized amount of paste. For children under 2 years of age, consult with a doctor or dentist. Instruct your child in good brushing and rinsing habits. For best results, brush teeth twice daily, after each meal, or as directed by your dentist, and floss daily. The colour of these products is derived from the natural ingredients and can vary from batch to batch. Calcium carbonate, Sorbitol, Aqua/Water/Eau, Glycerin, Silica, Sodium Lauroyl Glutamate, Xylitol, Xanthan Gum, Cyamopsis Tetragonoloba (Guar) Gum, Supercritical Extracts of Vitis Vinifera (Grape) Seed*, Glycyrrhiza Glabra (Licorice) Root*, Foeniculum Vulgare (Fennel)*, Eugenia Caryophyllus (Clove) Bud*, Azadirachta Indica (Neem) Leaf*, Azadirachta Indica (Neem) Bark*, Mentha Piperita (Peppermint) Oil, Potassium Sorbate, Mentha Viridis (Spearmint) Oil, Ascorbic Acid. Calcium carbonate, Aqua/Water/ Eau, Sorbitol, Glycerine, Sodium Lauroyl Glutamate (derived from naturally occurring amino acid), Xylitol, Xanthan Gum, Cyamopsis Tetragonoloba (Guar gum), Potassium Sorbate, Silica, Supercritical Extracts of Vitis Vinifera (Grapeseed*), Eugenia Caryophyllus (Clove Bud*), Azadirachta Indica (Neem Leaf* and Bark) , Elettaria Cardamomum (Cardamom seed oil*), Illicium Verum (Star Anise fruit*), Cinnamomum Zeylanicum (Cinnamon Bark*), Glycyrrhiza Glabra (Licorice root*), Ascorbic Acid (Vitamin C). Calcium Carbonate, Sorbitol, Xylitol, Glycerin, Silica, Carrageenan, Natural Pineapple Flavor, Potassium Sorbate, Azadirachta Indica (Neem) Leaf Extract*. Cured my gum recession in 2 weeks!! I’ve been using the powder form toothpaste and the mouthwash and this stuff is amazing! I seriously can’t get over it. My gums had been receding more and more and I take good care of my teeth. I recently found out I have systemic candida and had thrush! Dentist never thought to share that with me... anyway after going to a naturopath and finding out about the candida I decided to research antifungal and antibacterial toothpaste. My gums were red and thin and fragile and had receded throughout my entire mouth. Literally within 2 weeks I have no more sensitivity in my gums and the recession is GONE.  thank youuuuuu for this product. I’m going to try the shampoo as well! And I’m a hairdresser and educator so of course will share my experience with everyone! I bought this toothpaste after reading the reviews. I need my bottom gums tightened. I read reviews saying it tightens gums. Gets gums healthy. Well i been using it for about 3 weeks and nothing of the sort has happened so quiet disappointed. We are sorry you are dissappointed, however, 3 weeks is a relatively short period of time. We would also suggest using mouthwash and the neem caplets together with toothpaste to elevate the delivery of actives to the gums. We offer a value pack with all 3 items. This tasted beyond disgusting and gave both my wife and me a bad headache. 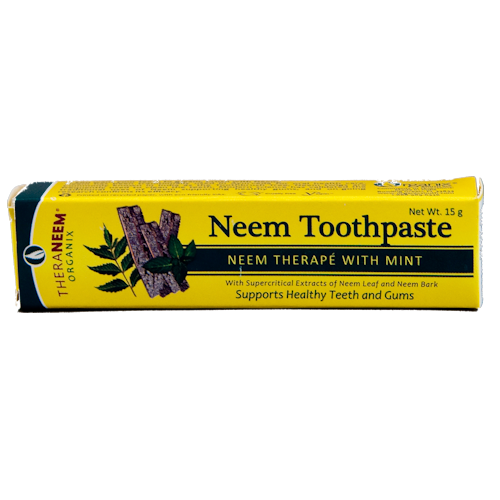 I am thrilled with the Neem toothpaste, and with the efficiency of Serendipity Herbals. I was impressed with other Neem preparation so decided to give the toothpaste a try. Normally I have always used the usual toothpastes in any supermarkets so called whitening ones, and wanted to try this one. I am amazed at how the Neem toothpaste is getting rid of a couple of stains that nothing else has reduced. I would definitely recommend this toothpaste. Very happy with the purchase. My teeth feel really clean after and I think it reduces tartar build up. I will know for sure after my next dental check up. My husband thinks it makes his teeth look yellow though!